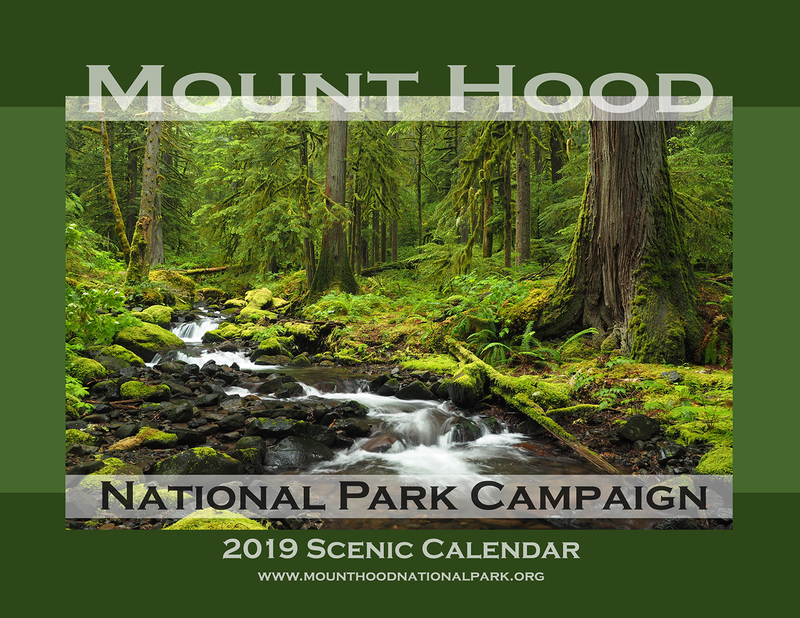 ‘Tis the season for top ten lists and year-end retrospectives, so in that spirit my annual Mount Hood National Park Campaign Calendar is pretty good snapshot of 12 favorite spots of mine across WyEast country this year. Since 2004, I’ve created an annual calendar dedicated to the campaign, each with a fresh set of photos. 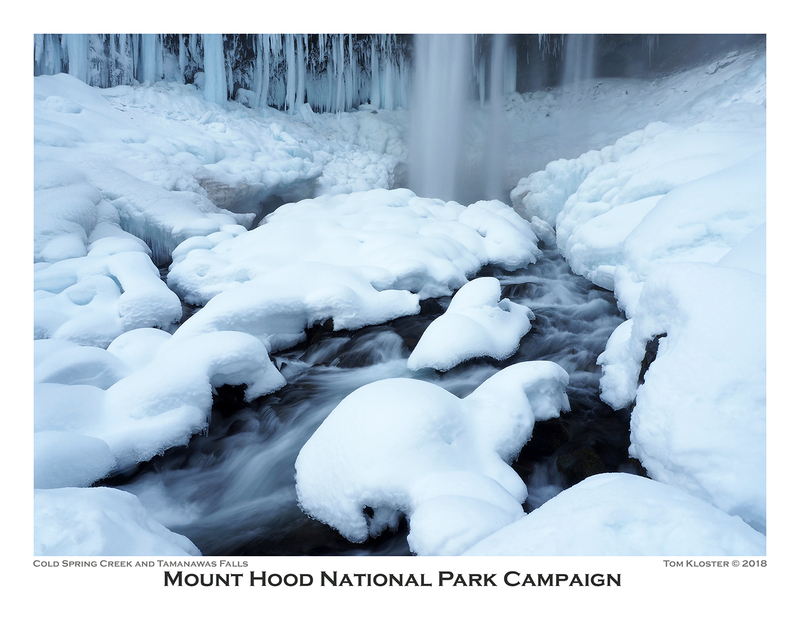 If you’d like a 2019 calendar, there’s info at the bottom of the article and ALL proceeds will once again go to Trailkeepers of Oregon (TKO). The annual campaign calendar has been a great motivator for exploring new terrain and improving my photography skills over the years. 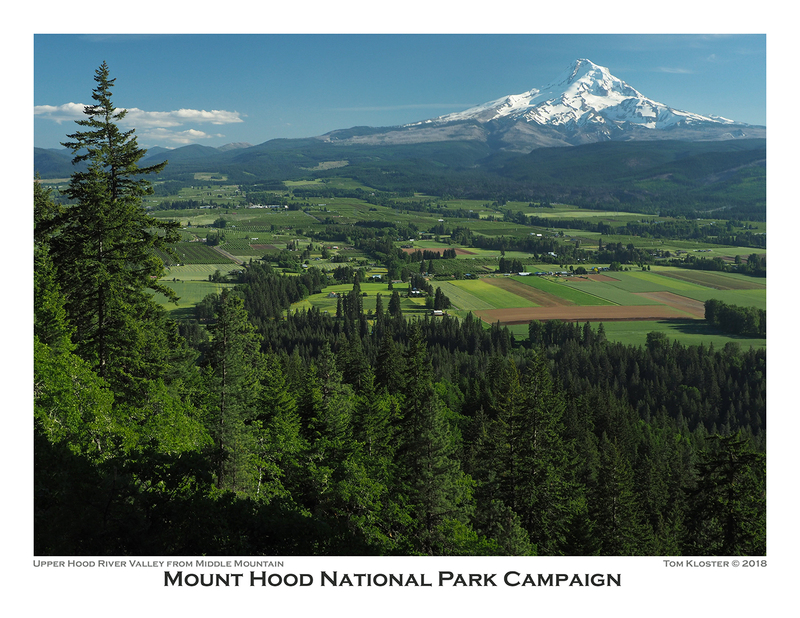 Each year the calendar project also renews my conviction that Mount Hood and the Gorge are uniquely special places, and deserve better care. This article is a short tour of the 12 spots that made it into the 2019 calendar, with a few stories behind the photos and reflection on these increasingly fragile landscapes. 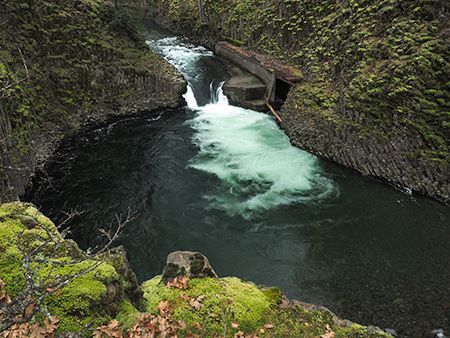 Starting with the cover image (at the top of the article), the calendar begins at lovely Whale Creek, a tributary of the Clackamas River that is also featured in the March image, so more about that spot in a moment. 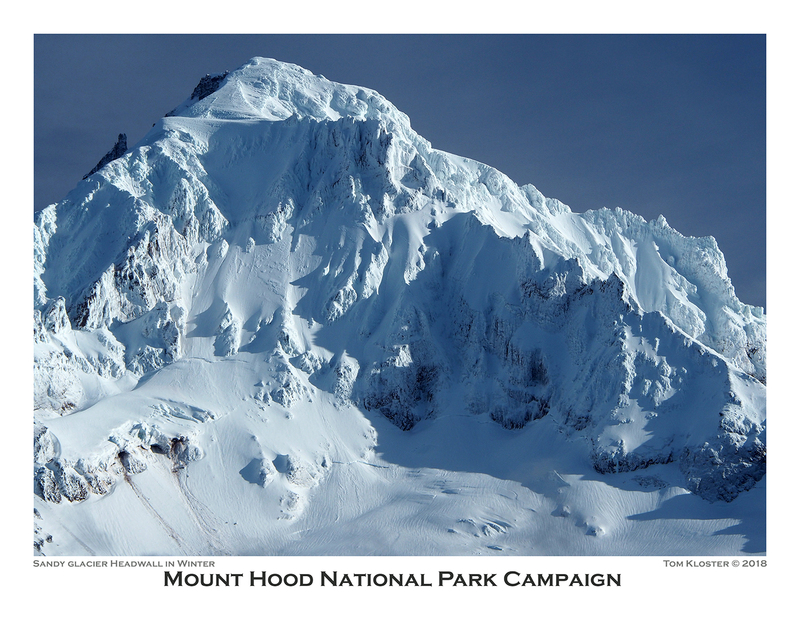 Next up, the January image (below) captures the awesome west face of Mount Hood, where the Sandy Headwall towers 3,000 feet above the Sandy Glacier. This snowy view was captured from near Lolo Pass last winter. Not included in the close-up view are the bare slopes of Barrett Spur (below) and other alpine ramparts of Mount Hood that still didn’t have their winter snowpack in early February, when these photos were taken. While it’s not uncommon to have a late snowpack in the Cascades, these events are becoming more common as global warming unfolds in our own backyard. Tamanawas is Chinook jargon for “guiding spirit”, and is one version among a couple variations in spelling. More challenging is the pronunciation, and with the advent of social media, all manner of spoken variations are being used. For some reason, an especially popular spoken version that doesn’t even correlate to the actual spelling is “tah-ma-WAHN-us”. It turns out the most accepted pronunciation is “ta-MAH-na-wahs”. I’ve been saying a slight variation of “ta-MAN-a-wahs” for most of my life, so I’ll need to work on that! As mentioned earlier, the March calendar image is from Whale Creek (below), located in the heart of the Clackamas River canyon. 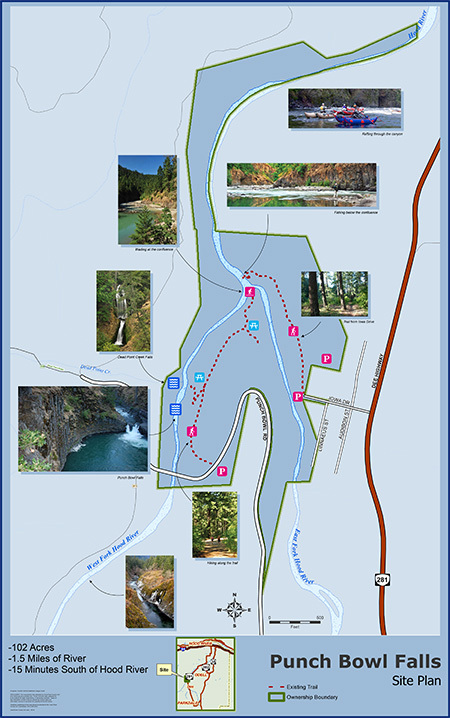 The creek is hidden in plain sight, flowing through the Indian Henry Campground and next to the east trailhead of the Clackamas River Trail. This area features some of the finest rainforest in WyEast country. Whale Creek was just one of many places in the Clackamas and Molalla River watersheds that I found myself exploring this year while much of the Oregon portion of the Columbia River Gorge was closed by the Eagle Creek fire. I visited the lower reaches of Whale Creek after seeing stunning photos of a string of waterfalls on the upper reaches of the creek, and quickly fell in love with this pretty stream. Watch for a future article on a trail concept I’ve been working on for Whale Creek with TKO and some area waterfall explorers. Sadly, the Clackamas River corridor has a bad reputation, thanks to a history of lawless behavior (the recent Pit Fire was started by illegal target shooting, for example) and a long history of Forest Service management that viewed the area more like a tree farm than a forest — and the two go hand in hand, by the way. 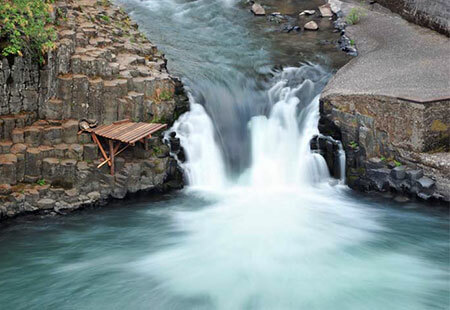 Yet, hidden in the now-recovering rainforests of the Clackamas are dozens of spectacular waterfalls, towering basalt walls and rugged vistas that rival the Columbia River Gorge in beauty. There are also a lot of big trees that somehow dodged the logging heyday of past decades. 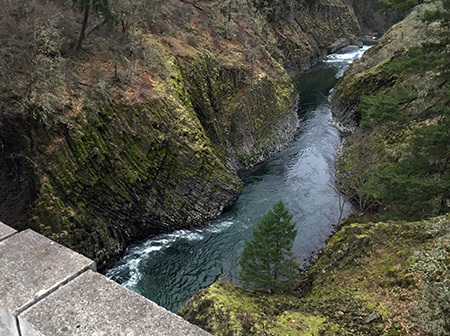 The Clackamas River corridor holds great promise for future recreation alternative to places like the Gorge, and the proven cure for lawless behavior is lawful recreation. I’m optimistic that we’ll make that transition here, and begin valuing places like Whale Creek for the intrinsic value of its forests, not just the saw logs it can produce. For the April calendar image, I selected a photo of White River Falls, both for the contrast in WyEast country ecosystems it displays and because this little state park could use some love and expanded boundaries. I posted an article with just such a proposal a few years ago, you can find it over here. The May calendar image features a sweeping view of the Upper Hood River Valley (below) from little known, seldom-noticed Middle Mountain. 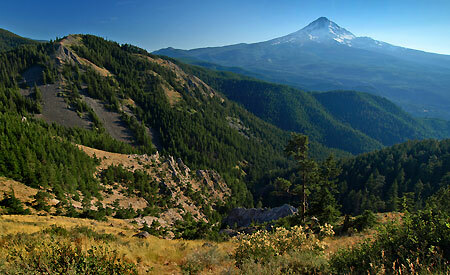 Its name tells the story, as forested Middle Mountain divides the upper and lower portions of the Hood River Valley. I learned of this spot about ten years ago from a local photographer and have gone back pretty much every year since. Zooming in a bit to this idyllic landscape reveals a seemingly timeless farm scene that is easy to take for granted. And yet, these farms were at great peril just a few years ago, when voters passed the deceptive Measure 37 in 2004. The law was pitched as a way for landowners to “seek compensation” for land use regulation, but in truth was just another end-run around Oregon’s protections for farm and forestlands. Voters later passed Measure 49, in 2007, blunting the impact of the earlier measure, but only after hundreds of urban-scale developments were approved in rural areas across Oregon (including a pair of giant, illuminated billboards along the Mount Hood Highway that still remain today). It was a reminder that while our farms may look timeless, we can never take them for granted. They will always need our support and protection if we want places like this to exist for future generations. 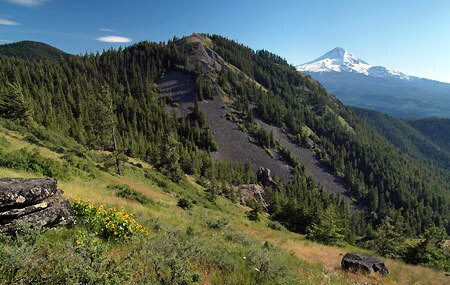 Much of Middle Mountain is owned by the public, where county-owned forest lands continue to be (mis)managed as a cash register by Hood River County (the county likes to refer to these land as their “tree farm”). Local residents no doubt enjoy their modest tax rates, as a result, but I’m hoping the rapidly changing demographics in Hood River will bring a different mindset to how the thousands of acres of county forests that ring the Hood River Valley are managed. One immediate concern on Middle Mountain is the manner of logging. 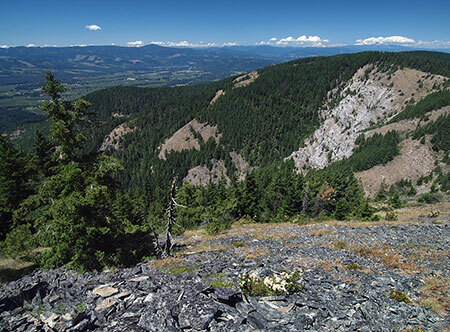 Large clear cuts, like those scarring the slopes of Middle Mountain, are an unsustainable practice, with proven harmful impacts to forest health, water quality and salmon and steelhead populations. Clear cuts are also the cheapest, easiest way to bring haul logs out of the forest. That bottom line might be unavoidable for private forests, but as a public agency, Hood River County should at least adopt a selective harvest policy that leaves standing trees in logged areas. The county should also reject the reckless use of herbicides sprayed on logged over lands. This is a practice the private industry uses to shortcut the natural forest recovery and speed up the next harvest. The idea is to destroy the recovering forest understory in a logged area so that plantation seedlings might grow a little faster. …might as well add “for now” to the last line on this boundary marker, unfortunately. Of course, the county could show real leadership and simply ban this practice on private lands in Hood River County, as well. That is, if water quality, wildlife, salmon and steelhead habitat, long-term forest health and tourism are a county priority over the fastest route to clear cutting more logs. My sense is that voters in Hood River County are increasingly focused on these broader concerns, even if the county leadership isn’t there yet. For the June calendar image, I selected another lesser-known spot, graceful Shotgun Falls (above) in the Molalla River canyon. This pretty, off-trail waterfall has been on my list for some time, and the Gorge closure inspired me to finally make this trip last spring for a much-needed waterfall fix. 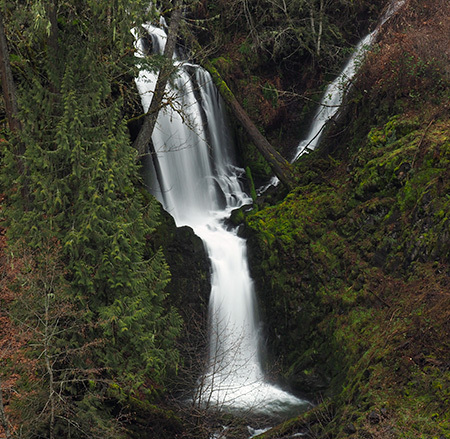 Shotgun Falls is a classic “Oregon” waterfall, cascading over a tall, mossy basalt cliff. 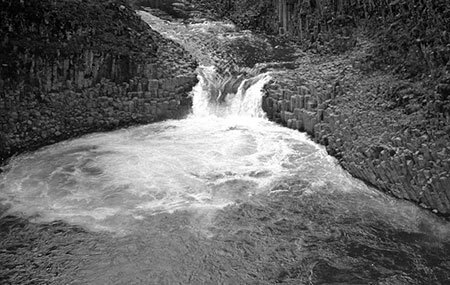 The falls is a short creek walk from the Molalla River Road, but protected by a 20-foot barrier falls just downstream that requires a slippery scramble to navigate. It’s an increasingly popular off-trail trip, and the streambed is starting to show the wear and tear, making this a great candidate for a proper trail that families with young kids and hikers looking for an easy waterfall trip could enjoy. More to come on this idea..! Sometimes a random moment burns a place and time in the forest into your memory. One such moment occurred on my trip to Shotgun Falls when my pack suddenly tipped while shooting photos from high above the falls. To my horror, it went bounding into the canyon, finally stopping just short of Shotgun Creek, about 60 feet below. Thankfully, my camera gear was safely zipped inside and I didn’t even end up with a soggy pack — the difference between a fond memory and forgettable one! Takes a licking, keeps on zipping! The July calendar image features a picture-perfect wildflower scene along Cove Creek (below), located at the base of Barrett Spur in Elk Cove. This idyllic spot is kept open by a deep, lingering snowpack in spring and regular winter avalanches that shear off trees, allowing the alpine meadows to thrive. Looking downstream along Cove Creek (below), 99 Ridge can be seen in the distance, covered with ghost trees killed by the 2012 Dollar Lake Fire. The fire reached the margins of Elk Cove, but passed over most of the forests here. On this trip to Elk Cove, I met a pair of hikers carrying their exhausted pup down the trail. When I chatted briefly with them, I was reminded that hikers are really nice people: they didn’t even know each other. The man carrying the dog had run into the woman as she struggled to carry her dog back to the trailhead. He offered to carry the poor pup the rest of the way! 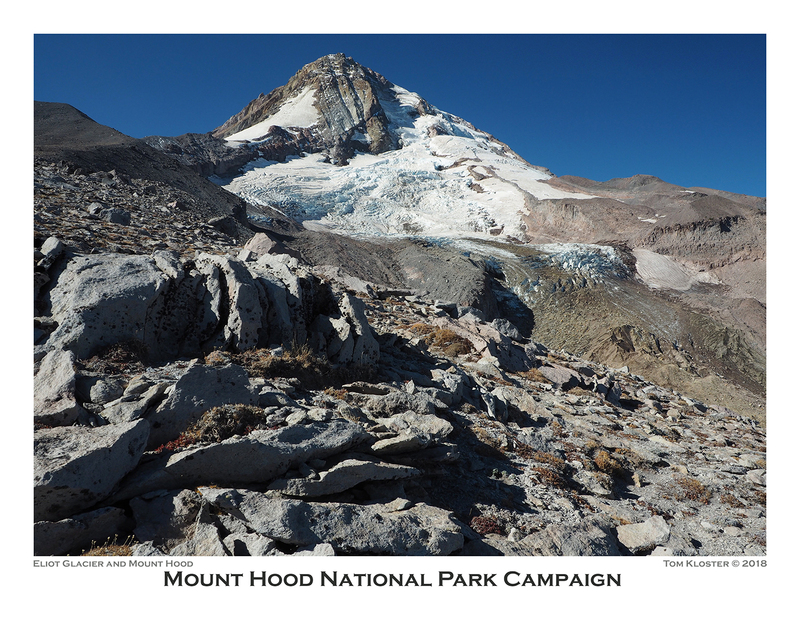 For the August calendar image, I selected a familiar view of Mount Hood from high on the shoulder of Cooper Spur (below). The Eliot Glacier dominates the view here, even as it recedes from global warming. As the glacier recedes, the exposed canyon floor once covered by ice has rapidly eroded, which in turn has begun to destabilize the moraines that flank the canyon. I experienced the hazards of the destabilized moraines firsthand when I stopped along the South Eliot Moraine that day and set my pack on a 4-foot long boulder that seemed to be the perfect trailside bench. Before I could park myself on the “bench”, it suddenly gave way, careening end-over-end into the Eliot Branch canyon, kicking off dozens of other rocks and an impressive dust storm along the way! Seeing the boulder finally land among the jumbled rocks 300 feet below was powerful reminder of the scale of this place, as the 4-foot “bench” rock was dwarfed by dozens of larger boulders scattered below the moraine. 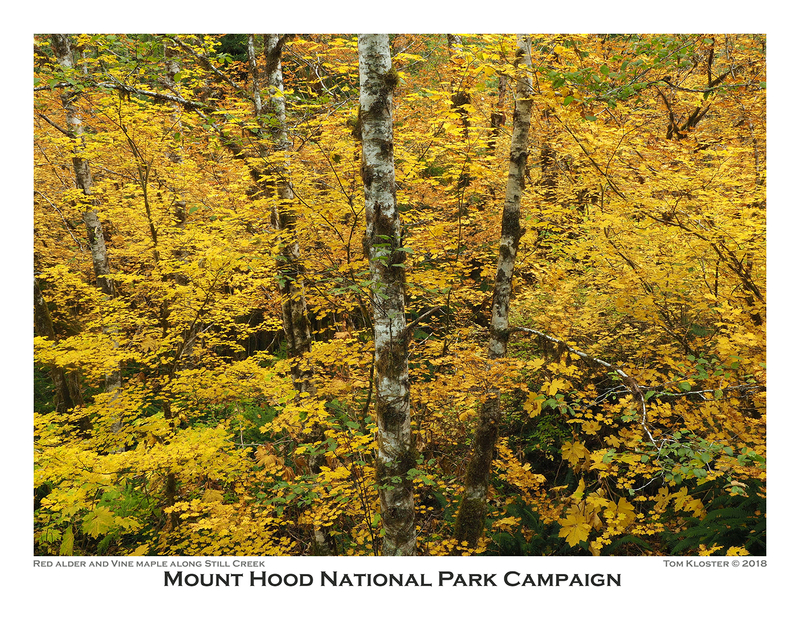 The September calendar image captures fall colors along Still Creek, on Mount Hood’s southwest side. 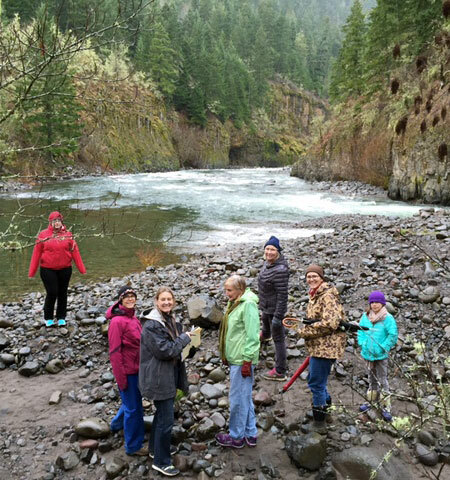 This photo was taken on a visit to a recent Forest Service project designed to restore salmon and steelhead habitat on Still Creek. The project site was a badly overused “dispersed” campsite that had become an eyesore over the years. To rehabilitate the site, the Forest Service excavated a large trench to block vehicle access to the streamside campsite, reinforced the barrier with a row of boulders. So far, these barriers seems to be working, as there were no signs of continued camping or off-road vehicle use in the area. At the heart of the restoration project, several very large logs with root wads attached (below) were hauled into the stream to create the natural “woody debris” habitat that our native salmon and steelhead rely upon. The logs and roots create deep pools and places for small fish to hide from predation as they mature to adulthood. There’s something primeval about uprooted trees lying across the creek. This is what most of our streams looked like before the settlement era, when forests were logged, streams were tamed and few big trees were left to become “woody debris”. 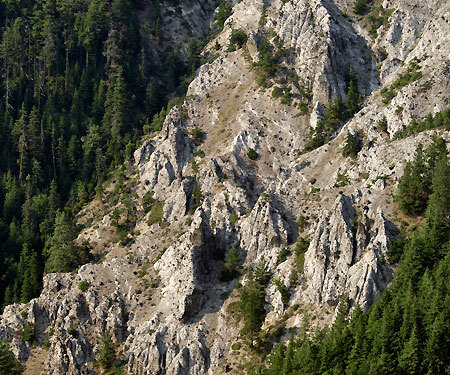 The panorama below shows the full extend of this Forest Service restoration project. On a select few days each fall, the first high elevation snow of the season is followed by a few days of bright, clear weather — and with any luck, all of this coincides with fall colors. 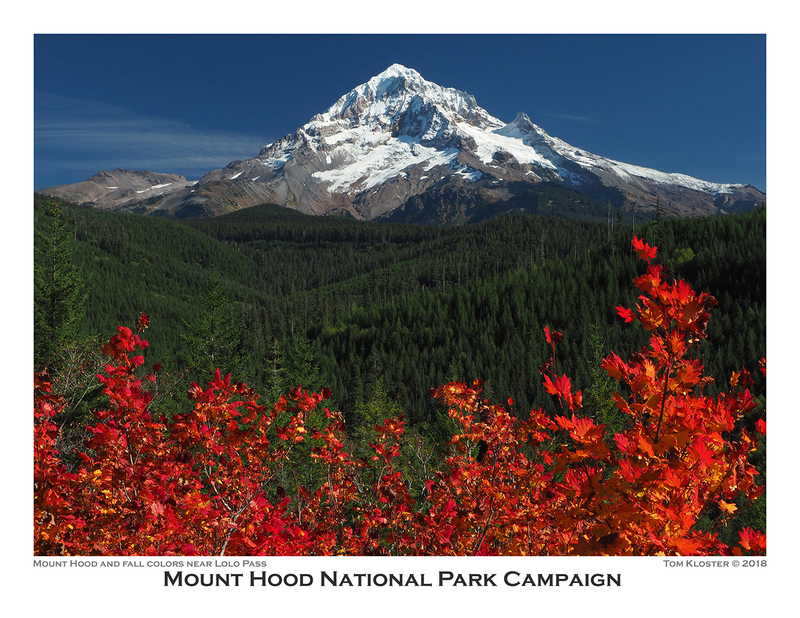 Such was the case in the calendar image I selected for October (below), with Mount Hood framed by flaming Vine Maple, as viewed from the Lolo Pass area. Whenever I shoot this scene, an image of a scalloped-edge vintage postcard is in my mind. Thanks to many postcards from the 1940s, 50s and 60s that captured this side of the mountain in autumn, the scene is iconic. This card (below) from the 1950s is typical of the era, and was captured just around the corner from where I shot the 2019 calendar image. Timeless inspiration, with fancy scalloped edges! 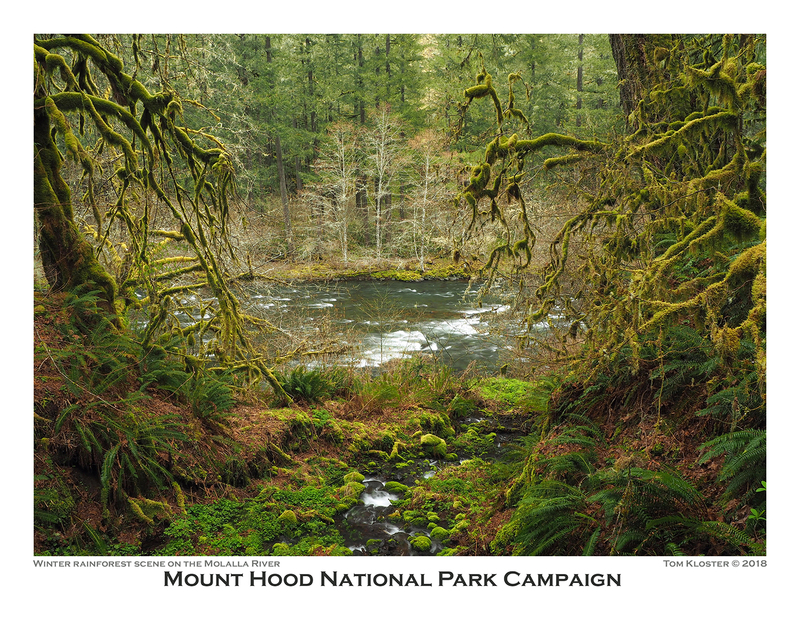 For the November calendar image, I selected a rainforest scene from along the Molalla River (below), where bare winter trees reveal the contorted, mossy limbs of Bigleaf and Vine Maple. While the above certainly scene looks pristine, it’s really not. One of my favorite photographic themes is to capture “pristine” scenery in places that are not — but could be, if managed with an eye toward restoration. Such was the case with the previous photo from Lolo Pass, where transmission towers were literally buzzing overhead, and with the Molalla River, where a road culvert dumped the little stream in the photo from a 4-foot galvanized pipe. …which turns out to not be all that pristine..! Beauty can be found everywhere, and the path to restoration in even the most impacted areas in WyEast country begins when we see places not just for what they once were, but for what they could be, again. 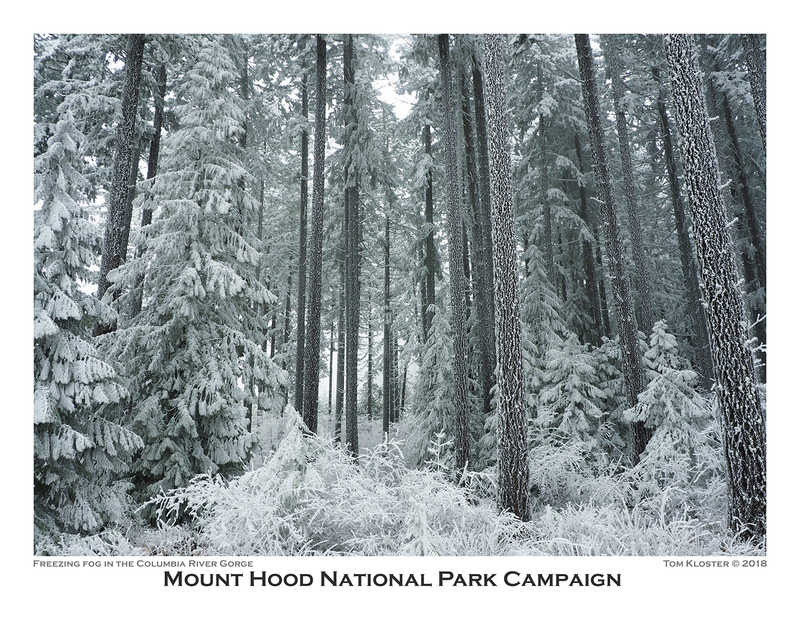 The December calendar image is a freezing fog scene from the east slopes of Mount Defiance (below). This stunning phenomenon occurs a few times each winter when temperature inversions blanket the eastern Columbia River Gorge with dense fog and frigid temperatures. The effect is magical, though traveling the roads in these conditions can be treacherous! The frosting of ice coating the forest in these scenes is called “soft rime”, and is made up of feathery, fragile crystals that can be brushed off like a fine powder. Soft rime forms when super-cooled vapor in fog accumulates directly on tree surfaces in delicate, elaborate crystals. Hard rime is defined as ice forming from freezing fog that first condenses to water droplets, then freezes on surfaces, creating a clear, hardened ice layer. Soft rime accumulations can be quite impressive in the Gorge, depending on how long the fog event lasts. These scenes were captured after five days of freezing fog and represent about the maximum amount of ice that can accumulate before crystals break off under their own weight. This photo (below) is a close-up of soft rime accumulations on a Golden Chinkapin growing on the slopes of Mount Defiance. These crystals as much as three inches long. The scene below shows an odd transition from bare road (and car) to frosted forest that looks like a photoshop creation. In this spot the rime had coated the trees and understory, but not the gravel road in the foreground, creating the strange two-tone scene. This photo is also a bit of a farewell, as my venerable trail car of the past many years years is featured. This old friend was retired to quiet a life in the city just a few months after this photo was taken, at the ripe old age of 13 years and 212,000 miles! 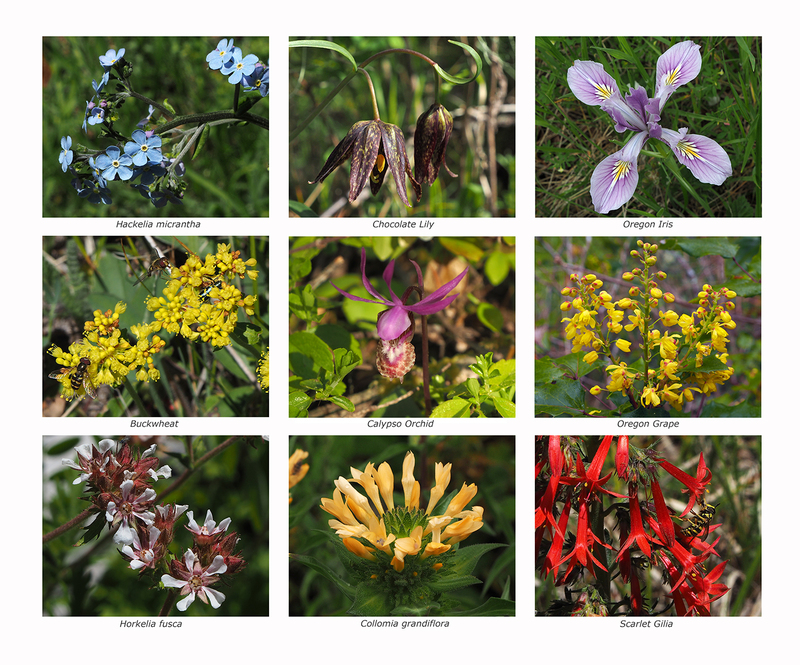 The back page of the 2019 calendar features nine wildflower images from the past year. If you’ve followed articles on the blog, you’ll recognize a several photos featured in stories on Horkelia Meadow and Punchbowl Falls. From top left and reading across, these flowers are Hackelia micrantha (Horkelia Meadow), Chocolate Lily (Punchbowl Falls Park), Oregon Iris (Shellburg Falls), Buckwheat (Horkelia Meadow), Calypso Orchid (Punchbowl Falls Park), Oregon Grape (Molalla River), Horkelia fusca (Horkelia Meadow), Collomia grandiflora (Clackamas River) and Skyrocket Gilia (Horkelia Meadow). So, that’s it for the 2019 campaign calendar! I’ve already started colleting images for next year’s calendar and I’m looking forward to yet another year of exploring all corners of America’s next national park. Maybe I’ll even see you out on the trail! In the meantime, you can order the 2019 calendar over at Zazzle. They’re beautifully printed, oversized designs with functional writing space — they’re working calendars and make great gifts! The calendars sell for $29.95, but Zazzle regularly offers deep discounts, so it’s worth watching for sales. 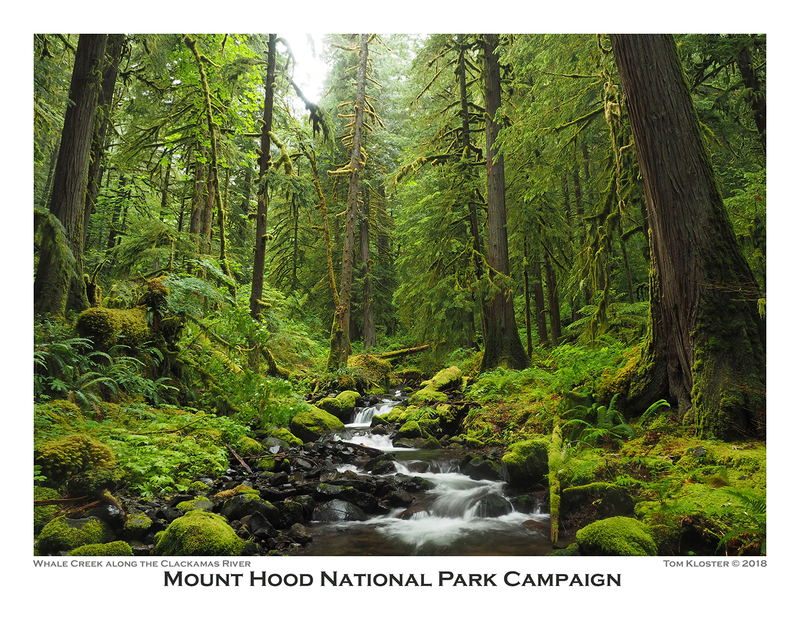 This year, all proceeds from calendars will go to Trailkeepers of Oregon (TKO). Thanks for reading this far, and I hope you’re able to get out and explore Mount Hood and the Gorge over the holidays! In late January, I posted an article on the proposed Punchbowl Park project at the confluence of the east and west forks of the Hood River. Since then, community activists have worked with Hood River County officials to move the project forward with a remarkable public outreach effort and bold vision for the new park. 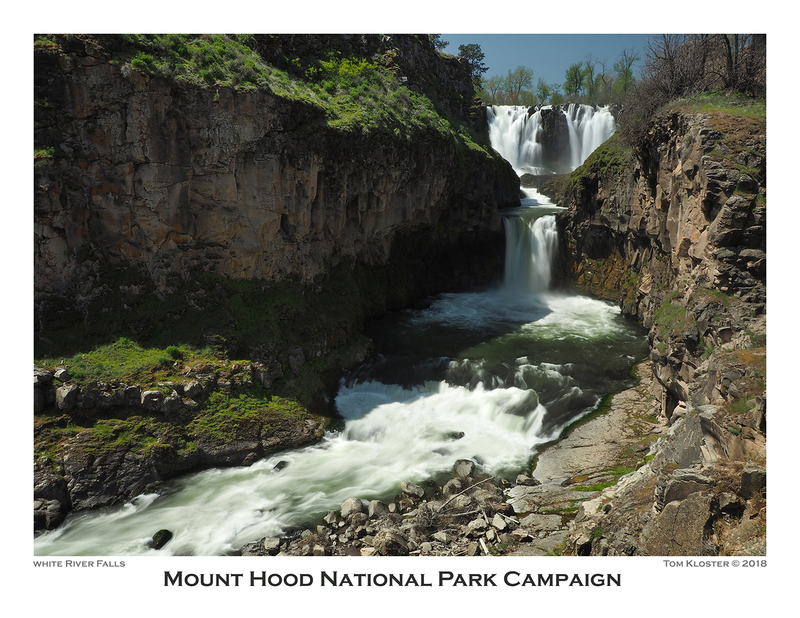 Heather Staten, executive director of the Hood River Valley Residents Committee (HRVRC) and the leading force behind the project took a few minutes this week to give an update on the project, and what lies ahead for this exciting proposal. WyEast Blog: How did the Punchbowl Park project get started, and what is the role of the HRVRC? Heather Staten: Hood River County and Western Rivers Conservancy, the property’s current owner, had worked unsuccessfully for several years on grants to fund acquisition of the 100-acre property as a County Park. Those efforts had flown under the radar of most local people, even those with close associations to the property. Last summer, David Meriwether, the County Administrator approached me about conducting a robust public process where we would really discover the community’s vision for the property. My organization, the Hood River Valley Residents Committee (HRVRC), was well-placed to run such a public outreach effort. We’re Oregon’s oldest local land-use advocacy group, with a 38-year history of protecting farms, forests and special natural places. David also knew me from the campaign to reopen Hood River’s libraries when they were closed due to budget cuts. So he knew we had both the local knowledge and organizational capacity to run a really inclusive public process. WyEast: You’ve made a real effort to involve the broader community in this planning effort. What are some of the most common themes you’re hearing? Staten: This was a community planning effort. I can’t imagine many planning processes that involved as many people as intensely as this one. Part of it is the nature of the property–it is spectacularly beautiful. People are passionate about it so they have strong opinions. They use it, love it and want to protect it. One of the things that was interesting to me was how people prioritized protecting the place over whatever they did there. There was real consensus that preserving the natural and ecological features of the place was the most important thing. Whenever there was choice that provided greater convenience for users but at the price of degrading the resource, the public always chose to protect the resource. For instance, they rejected campgrounds and drive up boat ramps. WyEast: What makes the site special in a way that warrants a public park? Staten: Everyone falls under the spell of the rugged wild beauty of the site and its unique and stunning combination of basalt columns, fast moving water and rich flora and fauna. 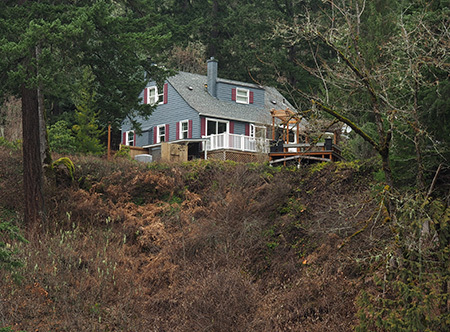 It packs a lot of diversity in a relatively small site — two waterfalls, the confluence of two rivers, basalt canyon, conifer forest on the west side of the property and a really lovely Oregon white oak woodland on the east side. There is the thrilling experience of walking along the ridge of the canyon with the water crashing far below then a very different experience down at the confluence when you stand at water level with rivers on either side of you joining together. The site provides rare and precious access to the river for anglers, kayakers, rafters and swimmers. In 15 miles, there are only a couple of legal public access points to the river. WyEast: The proposal includes several new trails. Aren’t there already trails on the site? What would the new trails offer and how would they be built? Staten: Until now the trail system has consisted of an old logging road and a spider web of social trails that people have created all over the ridge above the West Fork. People know about the waterfall, they can hear and see the water so they cut their own paths to get there. There are so many of these social trails that they are causing environmental damage. The big idea is to build a new trail to go where people want to go. The new trail will run along the ridge and connect the major, stunning views and access points along the west fork offering kind of a curated experience of the river canyon. Also as part of Phase One we’ll build a forest loop through the woods. We’ve got an even grander plan for Phase Two, a wooden footbridge over the East Fork that would link the east and west sides of the property. It will greatly expand the length of the trail system and offer a greater diversity of experience. The east side of the river is a hidden gem, with an intact Oregon white oak forest, great vistas of the confluence and river access to the main stem Hood River. The trail building will mostly be a volunteer effort. 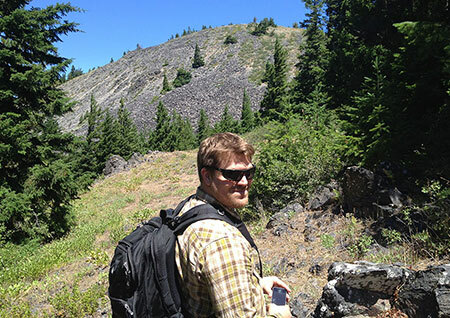 We were lucky to meet with Trailkeepers of Oregon (TKO) several months ago — their advice has been invaluable. 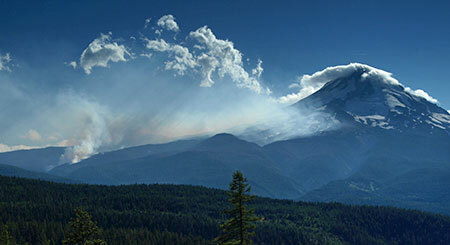 Trailkeepers will provide the professional expertise and tools and Hood River will provide the local volunteer muscle. 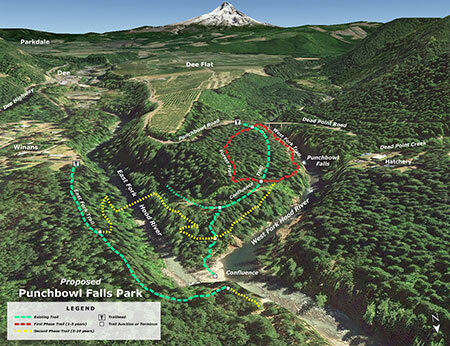 It’s a model that Hood River County has used successfully for all of their mountain bike trails on county forest land. 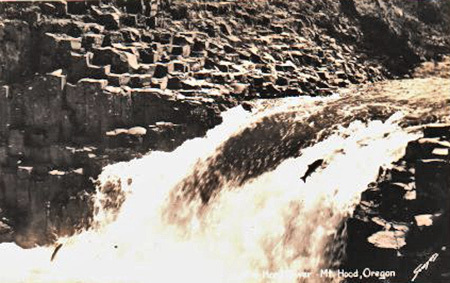 WyEast: Punchbowl Falls has been a traditional Native American fishing site, were tribal interests involved in the park planning? If so, what sort of themes did you hear from the tribes? Staten: The area around Punchbowl Falls, particularly the bowl just below the falls, has been a fishing site for members of the Confederated Tribes of the Warms Springs (CTWS) and their tribal ancestors for centuries. Tribal members attended the public meetings and we consulted with the manager of the CTWS hatchery program in the area. Tribal members were concerned with interference with their fishing season and with the protection of the riparian corridor for salmon and steelhead habitat. Along with ODFW, the Tribes have been working for the last few years to restore a spring Chinook run to the Hood River. Spring Chinook used to be a very productive fishery on the Hood River but was effectively extinct by the late 1960s, a casualty of dams and detrimental logging practices. 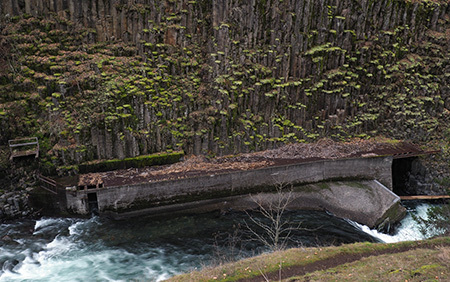 In 2010, the Powerdale Dam was removed from its location downstream from the Punchbowl area, making the Hood River a free-flowing river again. It’s still early, but there are signs that the chinook run is coming back, so tribal members were concerned that any development at the park, like trail building, be done in a way that did not effect water quality. Along with their treaty fishing rights, the tribes have some exclusive fishing rights at the property: only tribal members are permitted to fish within 200 feet of Punchbowl Falls. 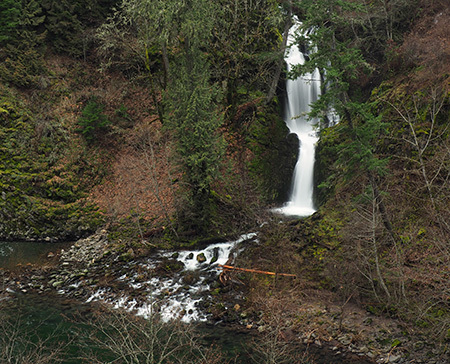 Sport anglers must stay downstream of that boundary, just north of where Dead Point Creek falls enters the Hood River. 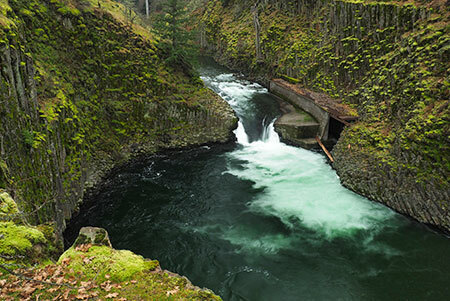 WyEast: When you visit Punchbowl Falls, it’s hard not to notice the concrete fish ladder that was built in the 1950s, as it’s a bit of an eyesore. 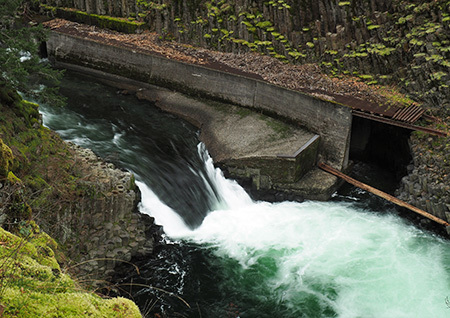 What is the long-term plan for the fish ladder? Staten: Yes, it is an eyesore, but it is used by fish as part of the salmon recovery program. There is not yet a plan for the fish ladder. Investigating whether the fish ladder could be removed was outside the scope of this project but definitely worth further research. 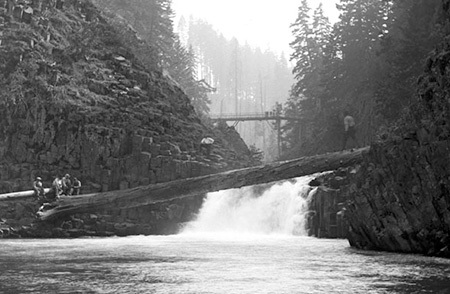 Punchbowl Falls is one of the most photographed locations in Hood River County so we have seen hundreds of old photos of the falls before the fish ladder was constructed in 1959. It does kind of break your heart when you see the basalt columns on the west side of the falls that have been replaced by that concrete. WyEast: Last week the Hood River County Board of Commissioners endorsed the Punchbowl Park proposal. What are the next steps? Staten: The Board of Commissioners endorsed the park proposal, committed to a budget to develop the park and authorized the County to apply for grants to fund the park’s acquisition. The Commissioners were supportive, enthusiastic and excited about the opportunity to create this park. The big deadline coming up is April 1, when we need to have our grant application in for the Local Government Grant Program of Oregon Parks and Recreation Department (OPRD). WyEast: Anything else you’d like to add? Staten: At the end of our presentation to the Board of Commissioners, the chair asked if anyone in the audience would like to speak. A gentleman stood up and said that whenever he went to a National Park, somewhere in experiencing the park, he felt a moment of gratitude because he realized that 100 years ago someone had the vision and the drive to save it for the public, like John Muir at Yosemite. He said that at Punchbowl, we had the opportunity to be the people that saved it for future generations. This is a park not just for us, but also for our great-great grandchildren. WyEast: Heather, thanks for taking the time to talk about the project, and for all your work in leading this effort. It’s truly a once-in-a-lifetime opportunity, and you’ve really galvanized the community with your vision for protecting this amazing place! To view a copy of the Punchbowl Park plan, click here to download a PDF version. Finally, a chance to save Punchbowl Falls! The centerpiece of this exciting proposal is Punchbowl Falls, a cousin to the more famous Punch Bowl Falls on Eagle Creek, in the Columbia Gorge. 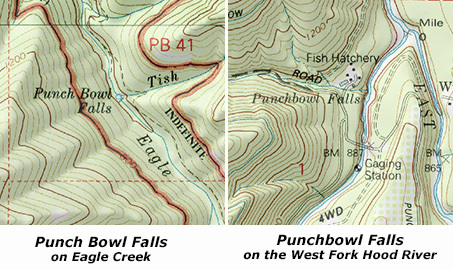 Both are textbook examples of a “punch bowl” waterfall, pouring into huge, circular bowls carved over the millennia by the upwelling action of the plunging waterfalls. While the more famous Punch Bowl Falls is taller, the Punchbowl Falls on the West Fork is far more powerful, and has carved a much larger amphitheater. The story of how Punchbowl Falls may finally be preserved for the public began in 2006, when the Western Rivers Conservancy acquired a 20-acre parcel containing the falls from West Fork from Longview Fiber (this is a company that has been aggressively clear-cutting its vast holdings in the upper West Fork watershed over the past decade at an alarming and reckless pace in recent years, so the risk to Punchbowl Falls was real). The surrounding 82 acres that make up the balance of the Western Rivers property were purchased from Pacificorp in 2010, in tandem with the utility removing its Powerdale Dam, a few miles downstream on the main branch of the Hood River. This purchase includes the beautiful and rugged confluence of the East and West Forks of the Hood River, a powerful spot that remains surprisingly wild and pristine, given the long human presence in this area. 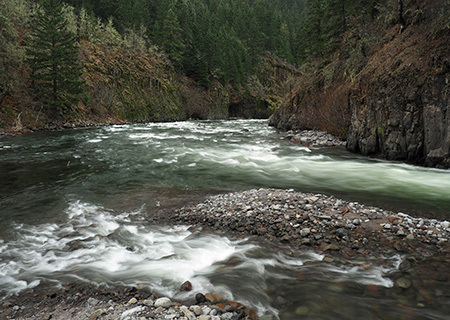 This acquisition marks the beginning of an ambitious effort by the Western Rivers Conservancy to acquire and restore thousands of acres of unprotected West Fork watershed that have been ravaged by relentless logging over the past 130 years, and the eventual restoration of native salmon runs to this beautiful canyon. 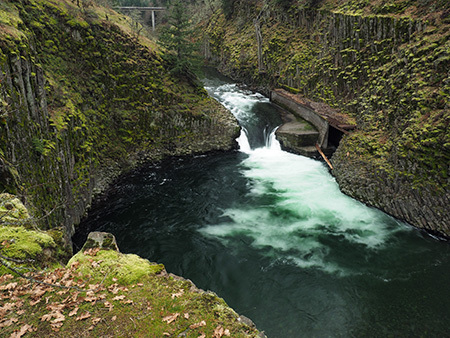 The removal of the dam and consolidation of private land in the spectacular Punchbowl Falls area are huge developments toward the long-term restoration of the Hood River riparian system. 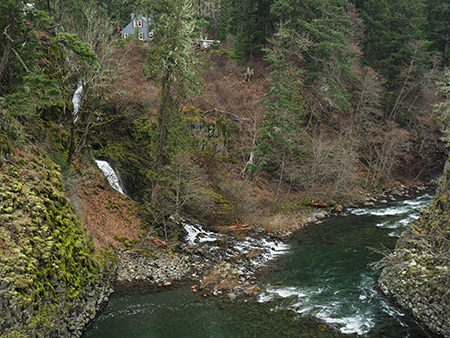 But much work lies ahead, and the most immediate question is whether Hood River County can secure the funds to purchase the 102 acre Punchbowl Falls site from Western Rivers Conservancy for $578,000 — an asking price that is about half the value of the property. To reach this goal, Hood River County is an application for an Oregon Parks and Recreation (OPRD) grant for purchase of this Punchbowl site. An unsuccessful application was submitted, but failed to win OPRD funding, so in this round the Hood River Valley Residents Committee (HRVRC), a local land-use advocacy group, is sponsoring community outreach activities to help broaden support for the county park proposal. The area has a long history of recreation as a popular swimming and fishing, which explains why the HRVRC events thus far have had a very strong response: 60 people attended the first community workshop in January, and more than 400 responses have been submitted to the comment website. 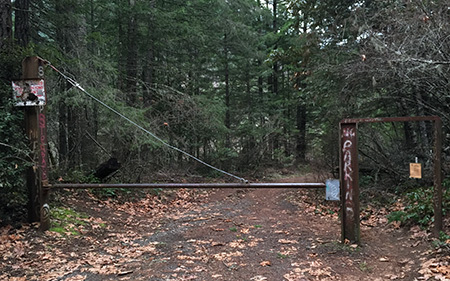 Should Hood River County fail to secure state funding for purchase of the site in the near future, the Western River Conservancy is likely to eventually sell the property to another private conservation group, putting future public access in question. While the site has never been more protected from private development, continued public access is now very much at stake. 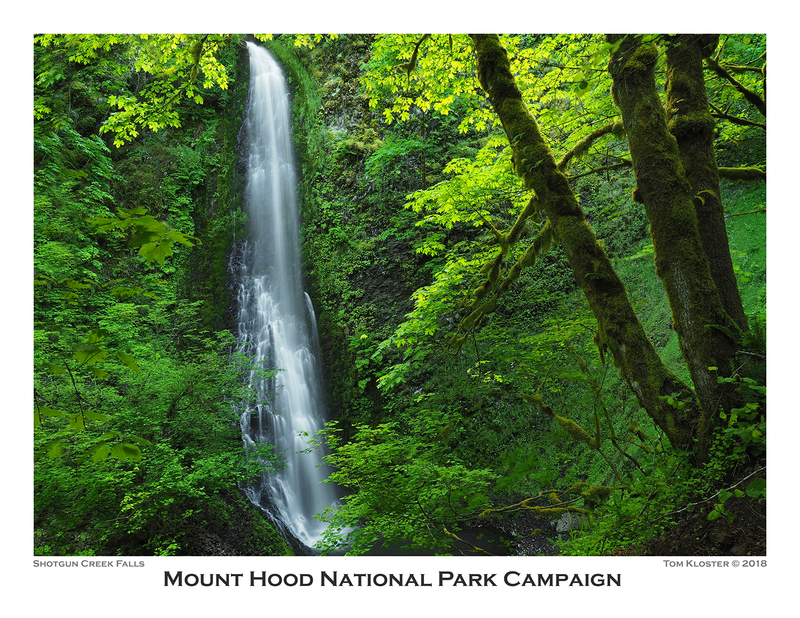 It’s apparently common for small communities like Hood River County to win funding on a second try from OPRD for projects like this, so your feedback and support is important in helping make the case to the State of Oregon that Punchbowl Falls and the Hood River confluence deserve to be both protected and forever open to the public as a park. Click here for a larger PDF version of the map. A short walk down a rustic service road leads to a maze of informal side paths veering off to the left, toward the imposing rim of the West Fork gorge. The main attraction here is the massive basalt amphitheater carved by Punchbowl Falls. 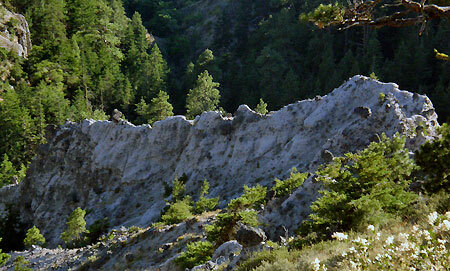 The walls of the canyon provide some of the best displays of columnar basalt jointing found anywhere in the region. How large is the amphitheater? The scale is hard to appreciate from photos, but Portland’s Memorial Coliseum would fit inside, with headroom to spare! That last step to the fish ladder is a doozy..! 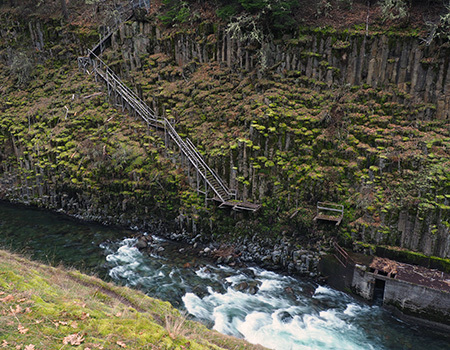 This is an example of the kind of feedback to include when you comment on the park proposal — for example, simply removing the stairs, and perhaps removing or modifying the fish ladder (below) could help it blend these features with the natural surroundings and make the area safer for visitors. 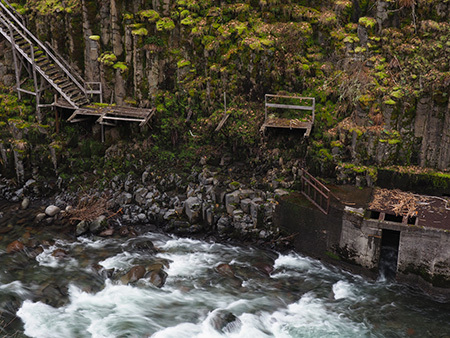 The structures above Dead Point Falls are part of a fish hatchery built by the State of Oregon in 1920. The state sold the hatchery at some point in the past, and it is now owned by Troutlodge, a private company that grows and markets fish eggs from several hatcheries in the western states. The hatchery has also been on the market over the past year, but (unfortunately) is not part of the park proposal at this time. Perhaps this could be a second phase of a county park purchase? After visiting a series of waterfall viewpoints along the canyon rim, the network of boot paths curves back to the primitive service road, which descends gently toward the confluence of the West and East Forks of the Hood River — about 1/2 mile downstream from the trailhead. The confluence is a remarkable place where two powerful rivers collide, creating an enormous gravel bar that makes for a fine lunch spot for taking in the scene. The West Fork enters the confluence at a leisurely pace, emerging from a deep pool between basalt buttresses. The East Fork (shown below) makes a more raucous entrance, roaring around a sharp bend in a series of steep rapids as it tumbles toward the West Fork. The confluence area is fully contained within the Western Rivers Conservancy property, and would be part of a future park. The conservancy holdings include the west (far) wall of the canyon for another mile downstream from this spot, and about the first half-mile of the east wall of the canyon beyond the East Fork is included. After returning to the trailhead parking area, it’s worth taking a few minutes to walk down Punchbowl Road to the dizzying concrete bridge that spans the upper gorge. There’s plenty of room to safely walk on the bridge, but the side walls are low enough that you’ll want to keep an eye on young kids and pets on a leash. From the bridge vantage point, the West Fork corkscrews through a narrow gorge carved into spectacular basalt formations. The gorge area surrounding the bridge is also within the Western Rivers Conservancy holdings, and part of the park proposal. The proposed park site also has trail access in the Winans community, located on the east side of the East Fork, where Iowa Street joins the Dee Highway, north of the Dee junction. 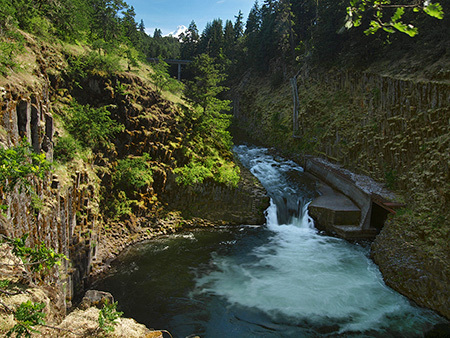 This trail is much less traveled than those in the Punchbowl Falls area, and mainly used for fishing access to the area below the confluence. How to find Punchbowl Falls? If you would like to visit the area after reading this virtual tour, simply follow the Dee Highway from Hood River to the old mill town of Dee, forking to the right and following signs to Lost Lake. Immediately after crossing the East Fork in Dee, head right at a sprawling 3-way intersection, then go straight at another 3-way junction, onto Punchbowl Road. Watch for a large parking area on the right after a short distance, just before the road crosses the high bridge over the Punchbowl gorge. 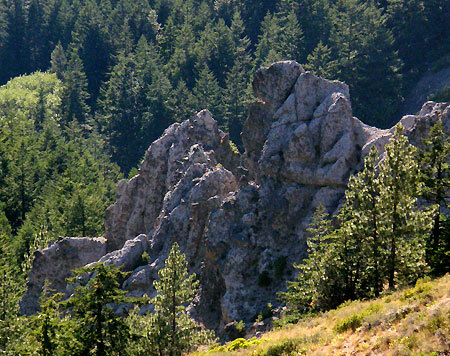 Hidden in plain sight above the Hood River Valley, Shellrock Mountain is a little-known peak with a familiar name. Though it shares a name with its better-known cousin in the Columbia River Gorge, the “other” Shellrock Mountain has much more to offer, and is easier to explore. 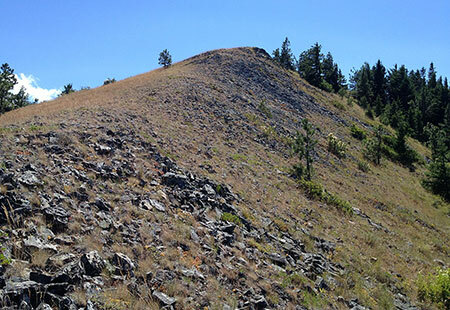 The “other” Shellrock Mountain is located along the Surveyors Ridge trail, a route popular with mountain bikers who ride from one glorious viewpoint to another along this well-traveled route. 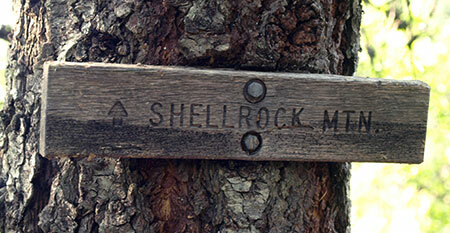 At one point on the trail, an obscure wooden sign points to Shellrock Mountain, but really just marks a short spur trail with a view of the south face of Shellrock. Beyond this modest view, few visitors take the time to explore the mountain or the rugged Badlands Basin, located nearby. Reaching the summit of Shellrock Mountain involves a short, stiff off-trail scramble up the northeast slope of the peak (more about that later), where a stunning view stretches from the nearby glaciers of Mount Hood to the big peaks of the southern Washington Cascades and arid desert country of the eastern Columbia River Gorge. 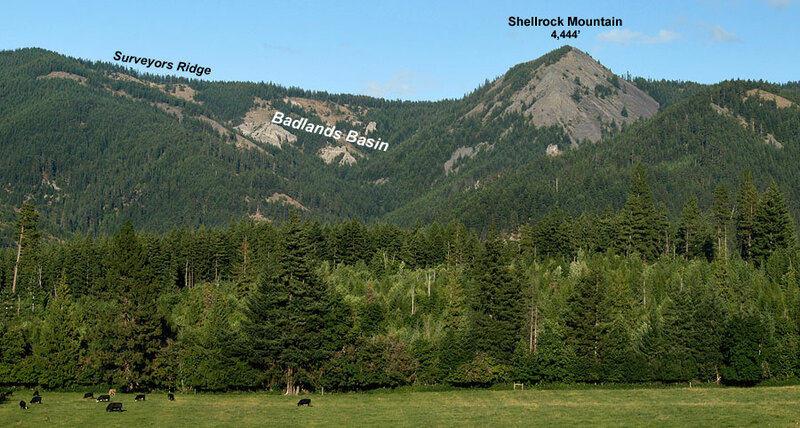 Shellrock Mountain sits astride the Hood River Fault, a 20-mile long scarp that forms the east wall of the Hood River Valley. 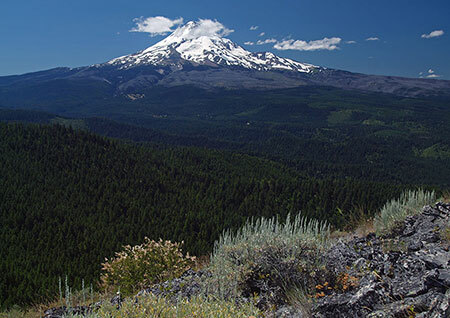 The scarp also forms the last high ridge of the Cascade Range in the Mount Hood area, with evergreen forests giving way to the arid deserts of Eastern Oregon just a few miles east of Shellrock Mountain. This proximity to the desert ecosystem brings together a blend of mountain and desert flora and fauna that make Shellrock Mountain and its surrounding area unique. 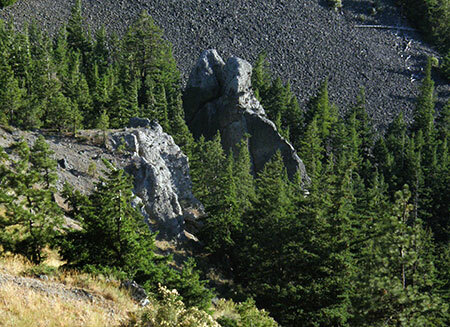 While most of the uplifted ridge along the Hood River Fault is composed of ancient layers of basalt, andesite and dacite, the Badlands Basin reveals the more recent debris of a pyroclastic flow, the same roiling mixture of steam, volcanic ash and rock that roared from Mount St. Helens in the May 1980 eruption. This flow originated from Mount Hood during its early formation. Badlands Basin is located at the headwaters of Cat Creek, on the north flank of Shellrock Mountain. Here, the ancient pyroclastic flow has been carved into a fantastic landscape of pinnacles, ridges and goblins that is unmatched elsewhere in the region. The Badland Basin formation spreads across about 100 acres, rising nearly 1,000 above Cat Creek. Exploring the Badlands Basin is a rugged and surreal experience for the rare visitors who make their way through the jagged formations. No trails go here, and the terrain is both steep and exposed. But once inside the formation, individual spires and ridges take on a new life, as their bizarre shapes come into focus on a human scale. The Badlands are surprisingly alive, too, with a unique ecosystem of desert and sun-loving alpine flora thriving in dry meadows among the rock outcrops. Together, Shellrock Mountain and the adjacent Badlands Basin are special places that beg to be explored. While the Surveyors Ridge Trail provides a good view into the area, new trails that explore the strange formations of the Badlands up-close and reach the airy summit of Shellrock Mountain could make these places much more accessible for hikers and cyclists. What would these new trails look like? 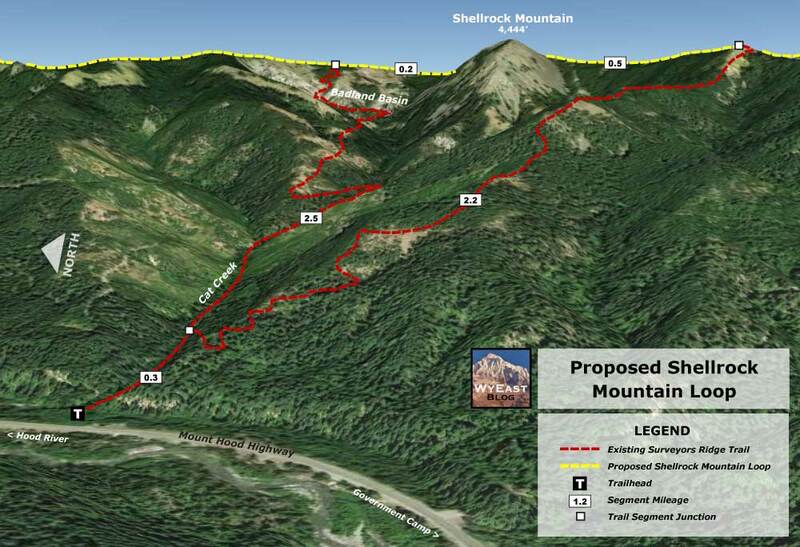 This proposal calls for a new trail to Shellrock Mountain and Badland Basin from the Loop Highway. Why start at the highway? It makes sense for several reasons: first, the new trailhead at Cat Creek would be only about one-third mile from the popular Dog River Trailhead, making a long and spectacular loop possible for mountain bikers, as the Dog River Trail also connects to the Surveyors Ridge Trail. Second, a highway trailhead would make the area much more accessible and secure for all visitors, as highway trailheads are easier for law enforcement to patrol, and highway traffic, alone, acts as significant deterrent against car clouters. Finally, a trailhead along the Loop Highway could be open most of the year, allowing for winter snowshoe access to the high country around Shellrock Mountain when the Surveyors Ridge Road is buried under snowdrifts. 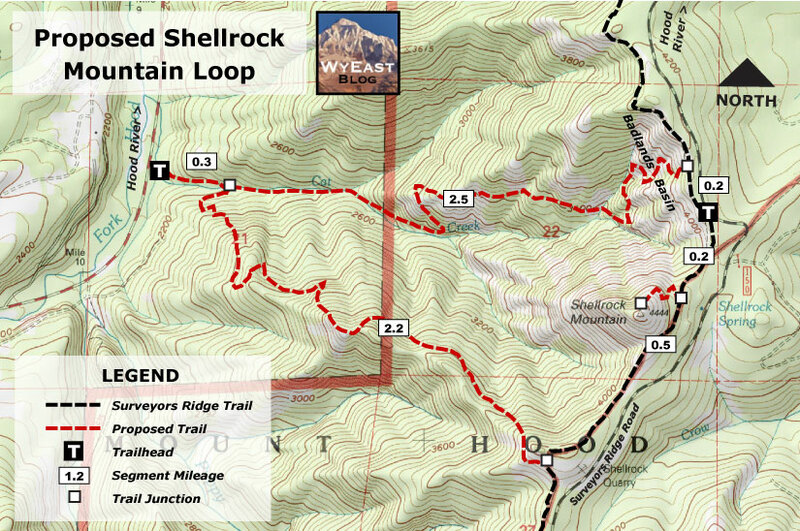 The proposed Shellrock Mountain Loop would have two legs: a 2.5 mile northern leg would follow Cat Creek to the base of Badlands Basin, then wind through the rock formations to a junction with the Surveyors Ridge Trail. A southern leg would climb the long ridge west of Shellrock Mountain to a separate junction with the Surveyors Ridge Trail, about a mile south of the northern leg. The Surveyors Ridge trail would connect these new trails, creating the loop. 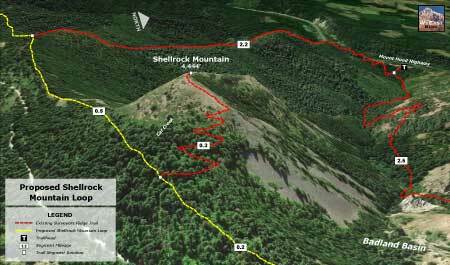 A short summit spur trail would lead from the existing Surveyors Ridge Trail to the rocky top of Shellrock Mountain, providing a side-trip option for cyclists on the ridge and the main destination for hikers on the new Shellrock loop trail. 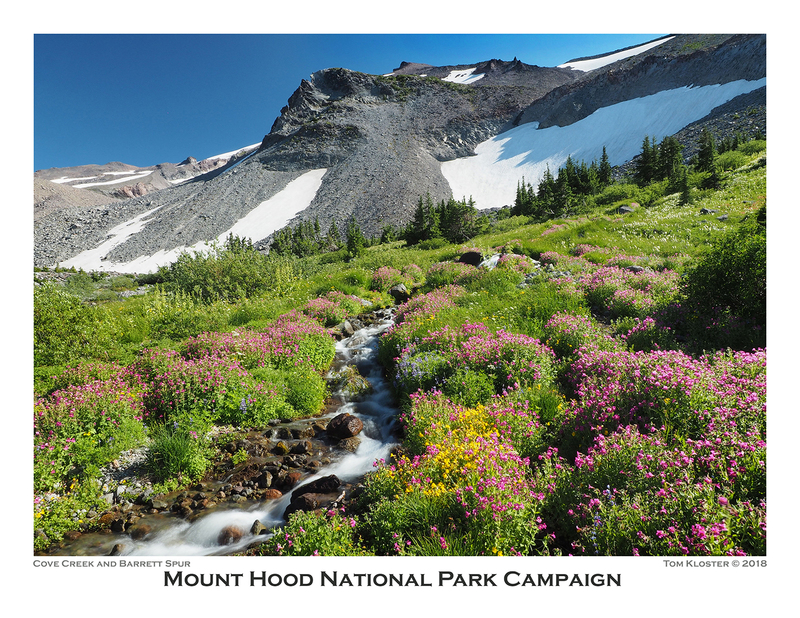 In 2009, President Obama signed a bill into law creating the Mount Hood National Recreation Area (MHNRA), a small but significant new form of protection for the Mount Hood area. The MHNRA concept has mountain bikes in mind, as it provides a way to protect recreation areas in a wild state, but without bicycle restrictions (under federal law, bicycles are not allowed in designated wilderness areas). The entirety of Shellrock Mountain and the Badlands Basin fall within the MHNRA designation, and as such, deserve to be considered for proposals like this one. The Forest Service has shown an encouraging willingness to work with mountain biking advocates to build new bike trails in the Surveyors Ridge area, too. 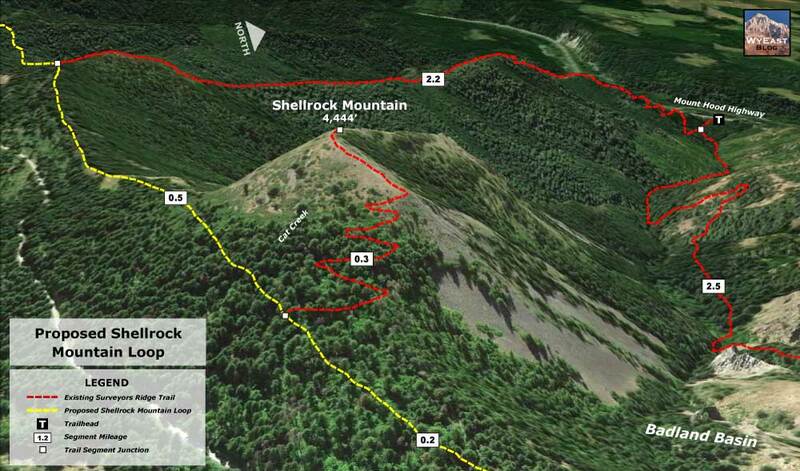 So while the agency has generally opposed building new trails anywhere else, there is a good chance that the Shellrock Mountain Loop could be build if mountain bike advocates were to embrace the idea. The first mile of both legs of the new trail would also fall on Hood River County land. The county currently focuses most of its energy on logging its forest holdings, but has worked with mountain bikers in the Post Canyon area to diversify the kinds of uses that county land can be dedicated to. In the Shellrock Mountain area, Hood River County has already logged off the big trees, so hopefully the County would see the wisdom of shifting the focus in this area to recreation, as well – and possibly consider funding for trail construction, as well. Most importantly, mountain biking advocates like the International Mountain Biking Association (IMBA) have a terrific record of trail building, and with help from other trail advocates like Trailkeepers of Oregon (TKO), could be the catalyst in bringing together a collaborative effort of volunteers, the Forest Service and Hood River County in creating this new trail system. 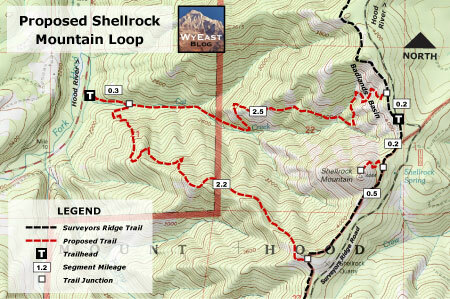 Sturdy hikers can visit Shellrock Mountain today with a bit of wayfinding expertise and some bushwhacking skills. The best starting point is an unofficial trailhead located along the Surveyors Ridge Road. To reach the trailhead from Hood River, drive the Loop Highway (OR 35) ten miles south of I-84 to a crest just beyond the Mount Hood Mill, where you turn left onto Pinemont Drive. This road eventually becomes Surveyors Ridge Road, alternating between paved and gravel surfaces, but is always easily passable for any car. At almost exactly 11 miles from where you turned off the main highway, watch for an unmarked trail heading to the right at an obvious bend in the road. Park here, and follow the short path to the Surveyors Ridge Trail, just a few feet off the gravel road. Shellrock Mountain is visible directly ahead of you! From here, turn left (south) and follow the Surveyors Ridge trail for about one-third mile to a gentle crest along the forested east shoulder of Shellrock Mountain. If you pass the trail sign pointing to Shellrock Mountain, you’ve gone too far. At the crest, head directly uphill on whatever path you can find through the forest, then abruptly leave the trees and reach the open east slopes of Shellrock Mountain, where you will wind among patches of manzanita and ocean spray as you work your way toward the summit. Don’t forget to look back periodically to help you retrace your steps upon your return! Soon, you will reach the summit ridge with a series of viewpoints of the Badlands Basin (and your starting point) spreading out to the north and Mount Hood towering to the southwest. From this vantage point, you can also see the full extent of the 2008 Gnarl Fire that burned the eastern slopes of Mount Hood, sweeping from near Gnarl Ridge on the far left horizon toward Cloud Cap, located right of center. The historic Cloud Cap Inn was barely spared by this blaze. In 2011, the Dollar Fire was started by a lightning strike west of Cloud Cap, sweeping over the right shoulder of the mountain for several miles toward Lolo Pass. For more on the Dollar Fire, click here. You’ll want to linger on the summit, and be sure to bring along a good map to help you identify the many features near and far that can be seen from this lonely summit. 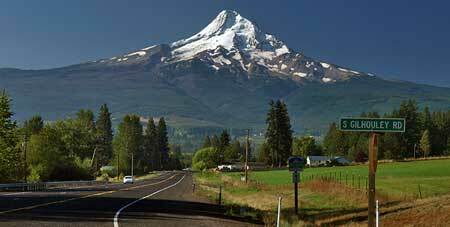 For photographer, the best time to visit in in the morning, which the light on Mount Hood is at its best. Few in the Hood River Valley would ever recognize the name “Gilhouley Road”, much less anyone from beyond the area. And yet, at the intersection of this obscure dirt road and the Mount Hood Loop Highway lies an imposing scene that is treasured by locals and tourists, alike: the first big look at Mount Hood as you descend into the Upper Hood River Valley. On a clear day, you’re guaranteed to see tourists pulled to the highway shoulder, snapping pictures of the mountain rising above bucolic pastures, even as semi-trucks roar past on the downgrade. The scene is irresistible. Earlier this year, a friend and national parks advocate from New England was visiting, and took the opportunity to drive the Mount Hood loop, and see “Oregon’s next national park”. Despite all of the mistreatment Mount Hood has seen, his sharpest critique was the shabby way in which we treat our visitors. He was amazed at the utter lack of traveler information — and confusing information, when it was provided. So, this article is inspired by his comments. 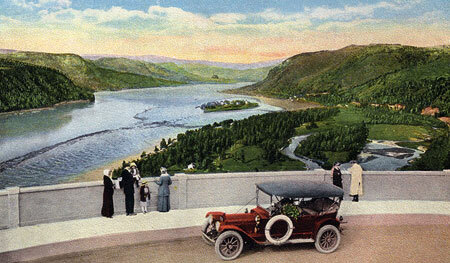 In the early days of auto touring, the Columbia River Gorge had the “King of Roads”, and among the great features of Samuel Lancaster’s magnificent scenic highway were the waysides and viewpoints that dotted the route. A family could load into their 1917 Packard Twin Six, and make a day of it, pulling off at each viewpoint, snapping photos with the family Brownie camera, and often following the short trails that led to still more views, or perhaps a waterfall. Times haven’t changed all that much, since, but the way we design our roads has. Tourists are now discouraged from stopping in many spots, and often take their life in their hands, if they do. Today’s highway engineers are much more concerned about keeping cars moving, at all costs. The Hood River valley has just one “official” roadside viewpoint, located on county-owned land at Panorama Point in the lower valley. 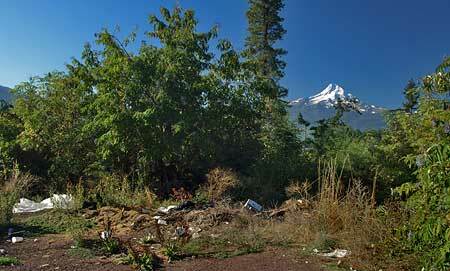 The scene is well-known, but also well removed from the Mount Hood loop highway by a couple miles. This proposal is for a companion overlook to Panorama Point, located in the upper valley, where the mountain first comes into full view for highway travelers, at the obscure junction with Gilhouley Road. In researching the possibilities for a new wayside at this spot, I first did a site inspection of the hillside above the highway: the area is recently logged, but with a fair number of mature trees left standing. The inevitable illegal dumping is present, of course — the scourge of public lands in highway corridors. But the view is breathtaking, with Mount Hood even more dramatically framed by hills, forests and fields than from the highway grade. According to public lands data, the land is mostly public, and owned by Hood River County. The map (above) shows a perfect rectangle of public property that extents east along Gilhouley Road from nearby Middle Mountain, largely encompassing the wayside site. One triangle of land (indicated with a question mark) may be a private parcel, but isn’t essential to the wayside concept. The approach to the site from Highway 35 is ideal: the intersection is located on a long, straight segment of road that would make for safe exit and entry from either direction. The presence of Gilhouley Road means that access is legally assured, with little possibility of an extended battle with ODOT for the right to build a wayside. The larger question is whether ODOT and Oregon State Parks would step up to make this a joint venture with local governments. It seems plausible, at least, given the lack of waysides along this portion of the loop highway, and the obviously heavy tourist traffic. What would the wayside look like? The site inspection revealed a surprising expanse of public land available at this site, so I’ve sketched a full-blown day use park as the proposed “Baldwin Memorial Wayside”. As the schematic (below) shows, there could be a viewing structure, picnic areas, a nature trail and restrooms. This degree of development puts the concept into the major investment category, but certainly not beyond reach, especially since there are no other state parks or waysides in the Hood River Valley. Because the site has recently been logged, the wayside proposal could be equal parts park development and habitat restoration. While the main feature would be a developed overlook for highway travelers, this proposal also takes advantage of the open hillside rising above the highway. A scattering of ponderosa pine spared from logging provides an excellent opportunity for an interpretive trail built around habitat restoration. 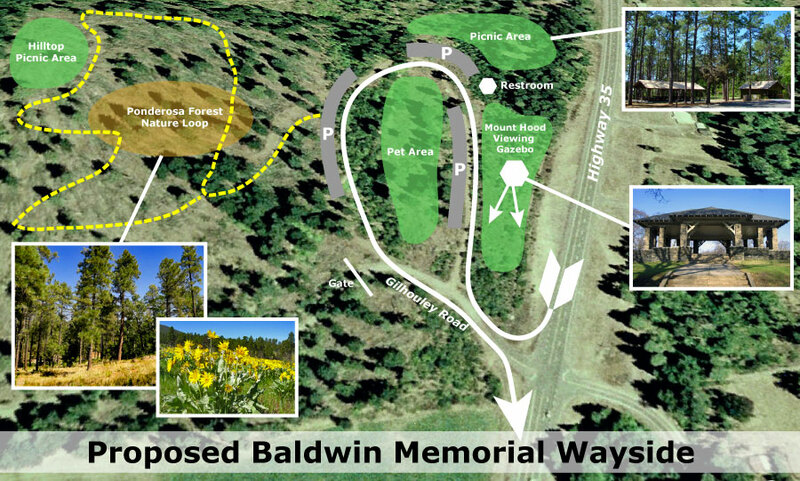 One interesting possibility could be a restored balsamroot and lupine meadow beneath the pines. These spectacular blooming species are native to the area, are already present on the site and could become a popular draw for spring visitors to the area, just as similar wildflower spots in the Gorge are now. Could a project like this really happen? 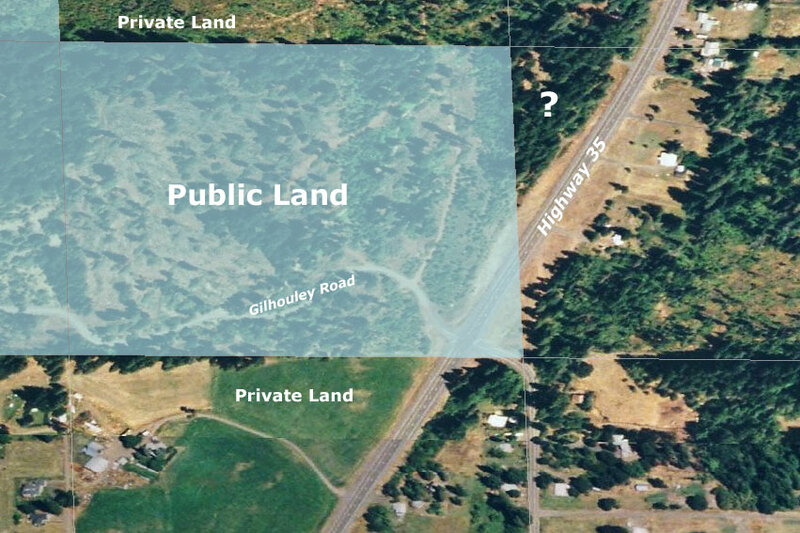 Some stars are already aligned: Hood River County already owns the land and access rights to the highway at Gilhouley Road. Together, these are an invaluable step forward, since the road guarantees highway access and the land can be used as a grant match for state and federal funds. The site also benefits from access to utilities and proximity to existing emergency services. These are all core considerations when creating a new public park. Most of all, it would take local leadership in the Hood River Valley area to secure state or federal funding through grants or other sources. Even in times of tight public budgets, this sort of project is achievable, especially if it helps reinforce the local economy and has an ecological purpose. Lastly, what would this new wayside be called? Well, “Baldwin Memorial Wayside” is simply borrowed from nearby Baldwin Creek, which in turn, memorializes Stephen M. Baldwin, who settled a claim along the stream in 1878. This would have made Baldwin one of the earliest settlers in the area. But this is where the connection to the Mount Hood view comes in: Stephen Baldwin’s son Mason “Mace” Baldwin became a well-known figure in Hood River County history in the early 1900s. Most notably, he was one of the founders of the legendary Crag Rats mountain rescue group in 1926, formed after the dramatic rescue he led that summer of an 11-year-old boy lost on Mount Hood. Mace Baldwin not only gave the Crag Rats their name, he was also elected to be the group’s first “Big Squeak” (president), and went on to take part in many mountain rescues over the years. The Crag Rats were the first mountain rescue organization to be formed in the American West. 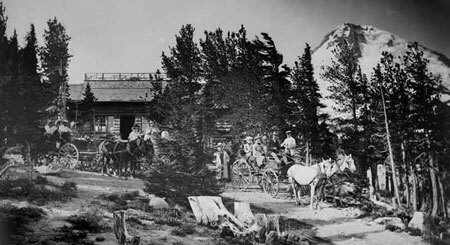 In 1954, the Crag Rats adopted the venerable Cloud Cap Inn, on the north shoulder of the mountain, and have since been the careful stewards under special arrangement with the Forest Service. The Crag Rats continue to be active today, and given the connection of this site to one of their founders, perhaps the “Baldwin Memorial Wayside” could include a tribute to these mountain heroes? It would certainly be a fitting memorial, and a fine way for visitors to enjoy the mountain view and learn a bit more about it’s rich human history.